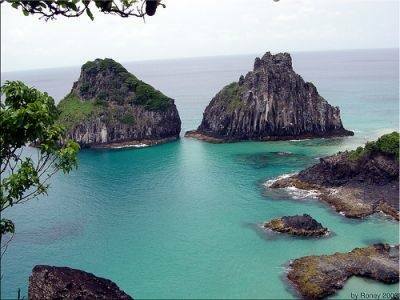 The Brazilian Atlantic Island chain or Fernando de Noronha and Atol das Rocas were declared a UNESCO World Heritage Site in 2001. Their rich waters are extremely important for the breeding and feeding of tuna, shark, turtle and marine mammals. These islands are home to the largest concentration of tropical seabirds in the Western Atlantic. Baia de Golfinhos has an exceptional population of resident dolphin and at low tide the Rocas Atoll provides a spectacular seascape of lagoons and tidal pools teeming with fish. All building is strictly controlled by Ibama (Brazil’s Environmental Protection Agency), but there are a number of luxurious hotels. There are many unspoilt beaches. 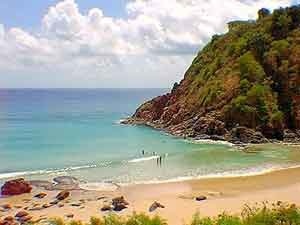 The scuba diving is excellent and dominates most activities on the island. From December to March, the seas are rougher, and so surfing draws quite a few visitors. 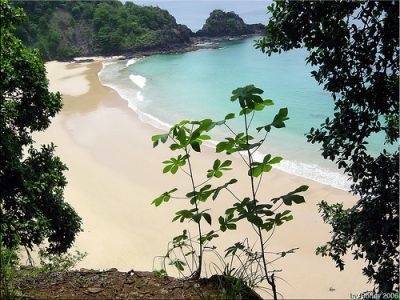 It’s an island paradise with an average temperature of 25c. The sun shines year round, but there is a rainy season which runs from January to August. Nearly all the people living on the island are involved in tourism and food is transported from mainland Brazil, meaning that prices for almost everything are double compared with anywhere else in Brazil. Fishing is illegal in the area, therefore fresh seafood is hard to come by.